Wal-Mart's latest quarter shows just what an uphill battle it has against more nimble online retailers. 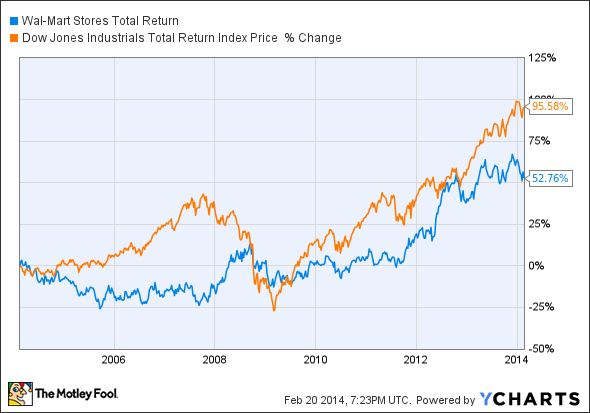 It may even be the worst stock on the Dow Jones Industrial Average in 2014. The Dow Jones Industrial Average (DJINDICES:^DJI) is up 106 points in late afternoon, and other indices are trading higher as well, after positive economic data was released this morning. The Conference Board's Leading Economic Index rose 0.3% in January despite bad weather across the country. A survey of manufacturing by Markit also rose to 56.7 this month from 53.7 in January; any reading above 50 indicates manufacturing expansion. As I'm writing, 25 of 30 Dow Jones Industrial Average components are moving higher and the only one significantly lower is Wal-Mart (NYSE:WMT), which has fallen 1.9%. The company reported earnings last night and can't seem to gain traction versus rivals such as Amazon.com (NASDAQ:AMZN), which are taking a larger share of retail right now. After being a market beater since going public, Wal-Mart has become a laggard over the last decade. WMT Total Return Price data by YCharts. Yesterday's disappointing fiscal fourth quarter and full fiscal 2014 earnings report indicates the company and its stock are not reversing course into a better direction. Wal-Mart's quarterly global revenue was up just 1.5% year over year, while income from continuing operations dropped 22.2% to $4.4 billion as higher operating costs ate into margins. When it comes to goods like TVs, Wal-Mart is competing on price alone and that's killing profits. The bigger concern is that Wal-Mart U.S. same-store sales have now fallen in four consecutive quarters after losing 0.4% in the fourth quarter. This is the same period in which Amazon's sales were up 20% and consumers decidedly shifted to purchasing goods online. The long-term trends are concerning for Wal-Mart as online retailers continue to take market share from brick-and-mortar stores. These retailers are more worrisome competitors now because they have scale that once only belonged to Wal-Mart. Every percentage point Amazon grows has to come from somewhere, and Wal-Mart is one of the main losers because it has always competed on cost. I think this is just the latest sign that Wal-Mart will be a big Dow laggard in 2014 and will have trouble making gains over the next decade. The face of retail is changing and it no longer belongs to Wal-Mart.